I care for Lefty’s arm more than I ever cared for my own. I am consumed by idea that his arm health is my responsibility at this age. I am on a journey of discovery. I spend a lot of time scouring the internet and speaking with coaches, players, physicians for information on age appropriate arm strengthening drills and injury prevention for Lefty. How can I strengthen and prevent injury to this 10 year old arm? As I begin my research, here is one thing I have learned. There are a lot of suggestions, but….there is no absolute guaranteed one way. Every player is physically different. Every arm is not the same. What works for one, may not be ideal for another. But, there must be some commonalities. I want to find those. I believe I can learn from the success of others. My journey includes speaking with current and former players. What did they do? What worked for them? Did they battle injury? How did they overcome injuries? I am going to speak with coaches at all levels. What are their conditioning programs? I am going to speak with physicians. What are their recommendations? What injuries do they see in young arms? Trends? I am on this journey to gain knowledge. It is my goal to learn 27 things that can help prevent injuries or strengthen Lefty’s arm. Why 27? Lefty’s favorite baseball player wears #27, Mike Trout. AND 27 sounds like a pretty lofty goal to me. If I can find one piece of information that will help in the proper care of Lefty’s arm and the arm of your young player, then the journey will be worth it. I hope you will join me. Click here. Great topic, I’m really excited to see what you come up with. 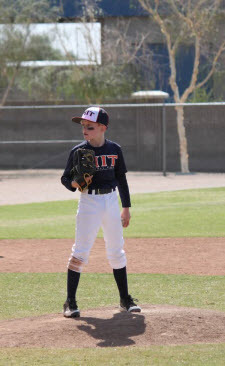 My son is 9 and moved from machine pitch to kid pitch last fall and after looking around the Internet, the only routine I have come up with is the post game and next morning “how’s your arm feel? ” looking forward to the next post.